Every holiday party needs some sort of snack mix, don’t you think? Sometimes it’s a homemade Chex mix, or maybe a puppy chow. But this Santa’s snack mix may be my new favorite! It’s combines some of my favorite snack mix ingredients which are topped with a peppermint spiked white chocolate. Oh, and they have tiny, edible Santa hats! This snack mix is incredibly easy to make and can be made just minutes before hand if you need to. Just set aside a bit of time to make the Santa hats, which are the most time consuming (and most fun) part. To make the Santa hat Bugles, first coat the Bugle in red candy melts then set them on a sheet of parchment or wax paper to harden. Once the red candy has hardened, tip the bottom in white chocolate or candy melts then into some sugar (granulated or sanding sugar will work). Let the bottom dry, then tip the top of the hat in and repeat with the sugar. Let the hats harden completely before adding to the snack mix. While the Santa hats are hardening, combine mini marshmallows, two different flavors of Chex (I used vanilla and wheat), pretzels, popcorn, and holiday M&Ms on a baking sheet. Melt good quality white chocolate chips over a double boiler or in the microwave until completely melted and pourable. Then stir in the peppermint extract and coconut oil. Drizzle the chocolate over the mix then sprinkle on crushed candy canes or sprinkles for even more festive flair! While the chocolate is still a bit melted, give the mix a few tosses to ensure that almost every piece of the mix is coated in chocolate. Let the chocolate cool and harden, then add in the Santa hats at the very end before serving so that all your hard work isn’t covered in white chocolate. And that’s all it takes to make a fun, tasty, and festive snack mix for your holiday party or to give away as a gift! Santa would be so proud! Line a baking sheet with parchment or wax paper. 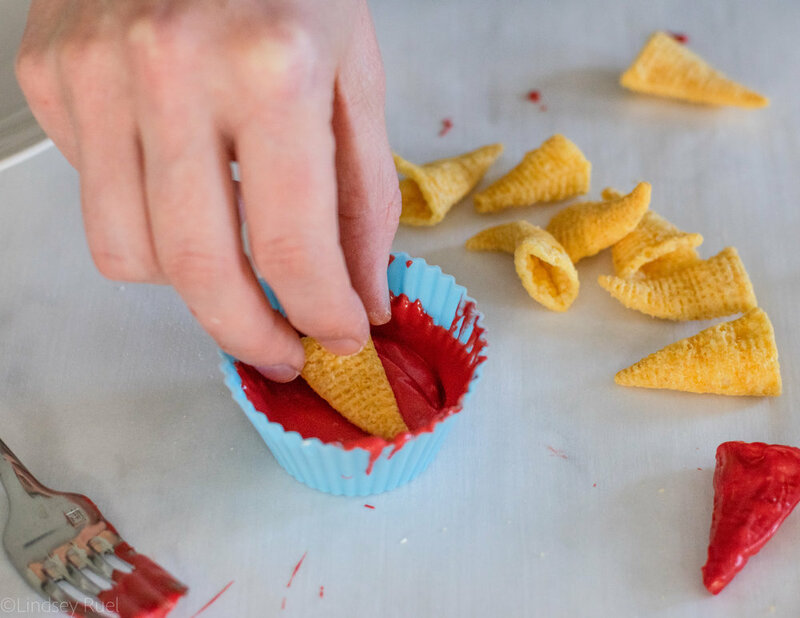 Using a fork or your finger, dip the Bugles, one at a time into the red candy melts. Scrape off any excess then let dry on the baking sheet. Pop in the fridge to speed up the hardening process. Once the candy melt has hardened, dip the bottom of the Bugle in white candy melt, then dip into the sugar. Let harden then repeat step on the top of the Bugle. Let candy melt harden completely. Meanwhile, combine the Chex cereal, popcorn, pretzels, marshmallows, and M&Ms in a bowl or on a baking sheet. Mix the coconut oil and peppermint extract into the melted white chocolate. Then pour over the snack mix. Add crushed candy canes. Toss to gently coat the snack mix. Once white chocolate has hardened, add in the Bugles and mix. Serve immediately or store in an air tight container for up to 1 week.